A similar manoeuvre to moving off, you are required to learn the angle start, also known as moving off at an angle or moving off from behind a parked car. What is an angle start? An angle start is where you stop at the side of the road behind a parked car. The parked car prevents you from moving off normally in a straight line, hence the angle start. Why Must I learn an Angle Start? An angle start is a manoeuvre that’s likely going to be required during your day-to-day riding as a qualified rider. It’s also a manoeuvre that will be requested by the examiner during your module 2 on-road test. Before attempting an angle start, you’ll need to have practiced moving off. This will typically be practiced on a flat, level road, clear from parked vehicles and other potential hazards. An angle start is primarily identical to moving off. Get your motorcycle ready to move off, use your mirrors and signal if it benefits other road users or pedestrians. Don’t forget the all important over-the-shoulder blind spot check before setting off. Along with the hazards already associated with moving off, with an angle start your view ahead is likely to be restricted due to the vehicle you have stopped behind. When you stop behind a parked vehicle, leave a good cars length between you and the parked vehicle. Unless it’s a very wide road, you’ll likely need to move off at an angle around the parked vehicle on the opposite side of the road. 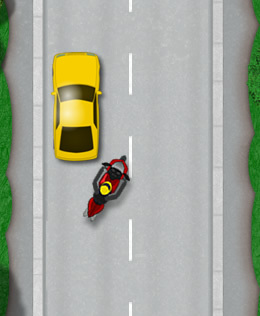 Leaving a car length between you and the parked vehicle means you can move off at a more shallow angle, giving you a better view of the road ahead and also no need to have your front wheel jutting out into the road creating a hazard which is more likely to happen when moving off at a steep angle. If you do stop too close behind a vehicle, you can of course wheel yourself backwards, but it’s always best to avoid unnecessary situations, plus there’s always a chance someone could stop behind you, which will limit your distance for manoeuvring backwards. 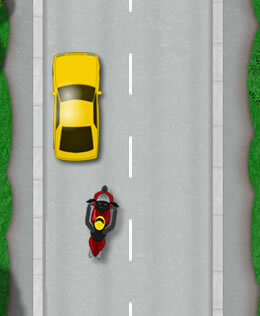 Always remember that motorcyclists are harder to see than larger vehicles. Prepare for car doors being opened in front of you. When moving off, leave sufficient room between you and the parked cars just in case anyone opens their car door. These are the key points to remember when making an angle start, and also what the examiner will be checking during the module 2 road test. Remember before moving off to check mirrors and blind spot. This is essential to safety and examiners are strict on this.